Lastly, time for the Magic tree. As with the Might and Spirit trees, Magic has undergone a bit of an overhaul to distinguish the hero choices more significantly. Overland Mana regeneration is 10% faster. +6 to max Mana. Overland Mana regeneration is 20% faster. +12 to max Mana. Overland Mana regeneration is 30% faster. +18 to max Mana. Cheaper than in Warriors of the North, and with a stronger effect on your Mana reserves to boot, though it's lost the effect of scaling with the rest of your tree. I've never thought Meditation was particularly a good idea for the game, so whatever. +1 Intellect. +5 Scroll capacity. Additionally, if playing as the Vampire: the Crystal cost for learning/upgrading Spells is reduced 15%. +2 Intellect. +10 Scroll capacity. Additionally, if playing as the Vampire: the Crystal cost for learning/upgrading Spells is reduced 30%. +3 Intellect. +15 Scroll capacity. Additionally, if playing as the Vampire: the Crystal cost for learning/upgrading Spells is reduced 50%. Obviously the Vampire should try to max Bibliophile as fast as possible before they get started too heavily on learning Spells. This really isn't any kind of burden, due to Dark Side's super-accelerated early game: you'll have leveled repeatedly before the game starts giving you an opportunity to be learning much in the way of new Spells anyway. There's exactly one possible Scroll chance before you should be Level 5-6, which is more than enough Levels to max Bibliophile and then move on to other things. For the other classes, Bibliophile is a low priority unless you really want to jump an Intellect breakpoint. +1 Mana per combat turn. +2 Mana per combat turn. +3 Mana per combat turn. Concentration has been halved in its effectiveness, but its cost has gone down, and for the Vampire in particular you tend to be rolling in spare Magic Runes anyway. It's also been made its most accessible ever, so its benefits are actually arguably the most pronounced they've ever been when you first start getting a hold of it, relative to your max Mana. For the Orc and Demoness, taking the second rank is debatable and the third rank is probably best to skip, just because they struggle more to spare the Magic Runes and it really is a fairly small amount of Mana, but the Vampire will want to max it if only to feed into Archmage once they've got that. The Hero can learn Order Spells. +2 Mana. The Hero can upgrade Order Spells to Level 2. +3 Mana. The Hero can upgrade Order Spells to Level 3. +4 Mana. The priciest Order Magic has ever been, ouch. (But this is because Spell spheres have been normalized so they all cost the same Rune totals) The additional Mana is a nice touch, especially when combined with how the other Spell sphere Skills do the same. It's a small amount of Mana, but since the Vampire is the most inclined to max all three Spell sphere Skills, it helps cement their mage-y-ness by meaning that just maxing the Spell sphere Skills gives them that little bit more Mana to use. It also makes it a little less frustrating to eg purchase the second rank just to upgrade one Spell, because there's a concrete benefit, however small it might be, for having the Skill rank at all. This all obviously applies to Distortion Magic and Chaos Magic. The Hero can learn Distortion Spells. +2 Mana. The Hero can upgrade Distortion Spells to Level 2. +3 Mana. The Hero can upgrade Distortion Spells to Level 3. +4 Mana. This is basically a straight upgrade to Distortion Magic, compared to Warriors of the North. Costs are unchanged, but here's some free Mana! The Hero can learn Chaos Spells. +2 Mana. The Hero can upgrade Chaos Spells to Level 2. +3 Mana. The Hero can upgrade Chaos Spells to Level 3. +4 Mana. I really appreciate Chaos Magic finally being made truly equal with the other Spell sphere Skills. It never made much sense to me that Chaos Magic was consistently placed as an 'advanced' sphere, as it's only really notable for being king of damage Spells, and broadly speaking the non-Mage-type classes are usually more interested in the utility Spells. This was particularly silly in The Legend, where the Mage outright started out knowing Fireball, making it largely redundant to actually learn Chaos Magic until they either wanted to upgrade it or had finally acquired a Chaos Scroll like Fire Rain or Sacrifice. So this is quite nice. Spells that heal and/or resurrect are 10% more effective. The duration of lingering effects is extended by 10%. Spells that heal and/or resurrect are 20% more effective. The duration of lingering effects is extended by 20%. Spells that heal and/or resurrect are 30% more effective. The duration of lingering effects is extended by 30%. Skill tree requirements: Order Magic and Distortion Magic. Regardless, Defiler is a bit of an awkward Skill in practice, generally only worth considering trying to max for its own sake if you're playing Bagyr. Neoline's armies are too large, and Daert's too irrelevant as you get deeper into the game. I kind of like the idea behind it, but the execution needed refinement. Positive and negative effects from Spells are 10% stronger. Positive and negative effects from Spells are 20% stronger. Positive and negative effects from Spells are 30% stronger. Skill tree requirements: Order and Chaos Magic. Warlock's effect does things like make Magic Armor give more resistance, Helplessness even further reduce Defense, etc. I've never gone through the full list of Spells to figure out what all Warlock actually does. For the most part, the player has little reason to care, and there's a lot of Spells -such as Bless- where I can't imagine what the effect would even be. In practical terms its effects are pretty random in their relevance, and generally too minor to care. There's a few Spells like Magic Armor where the effect could have been pretty notable, but there's generally a caveat -such as how Magic Armor doesn't stack properly with inherent resistances and Dark Side gives you gear for raising all the resistances of your units innately, limiting the Spell's relevance. In particular, since Daert is the class/character who can most readily afford Warlock's costs... there's the problem that he has the least incentive to care. He'd rather just nuke enemies directly. Spells do 10% more damage, as does Freeze, Bleeding, Burn, or Poisoning inflicted by a Spell. Spells do 20% more damage, as does Freeze, Bleeding, Burn, or Poisoning inflicted by a Spell. Spells do 30% more damage, as does Freeze, Bleeding, Burn, or Poisoning inflicted by a Spell. Skill tree requirements: Distortion Magic and Chaos Magic. It's Destruction/Destroyer/etc, but weaker than it's usually been but now it actually boosts the strength of percentile effects inflicted by your Spells so max it anyway even if you're not Daert! For Daert in particular, it is of course a must-have in general, and should be one of your earliest Skills to max so you can do maximum Spell damage. Straightforward enough. Effects that take control of enemies can take control of 10% larger stacks, and effects that summon new units produce 10% more units. Additionally, up to 2% of units summoned in battle can join the player's army after battle. Effects that take control of enemies can take control of 20% larger stacks, and effects that summon new units produce 20% more units. Additionally, up to 4% of units summoned in battle can join the player's army after battle. Effects that take control of enemies can take control of 30% larger stacks, and effects that summon new units produce 30% more units. Additionally, up to 6% of units summoned in battle can join the player's army after battle. Skill tree requirements: Defiler and Warlock. That's right, there's finally a Skill that lets you take your hordes of summoned Imps with you after the battle! However, it works for basically any summon within those limits, including the surprising case of Flames of Passion stacks! They need to still be alive when the battle ends, of course, and the utility of that particular case is a bit niche since your opposition is dominated by Of The Light units you probably won't have any use for if you do Puppeteer-recruit any, but among other points it can be leveraged for fully disposable meatshields and Sacrifice fodder and whatnot. Puppeteer is a cool Skill idea all-around, really. There are, unfortunately, two things that let it down: first of all, it's least useful to Daert, yet he's the one with the readiest access to it, and second of all... Blood Priestesses. Who cares about converting summons into 'real' units via a Skill when you can do so via a Talent at much more favorable rates no matter your class or Skill investment and from much earlier in the game? +2 Mana when a stack dies. Additionally, +1 Mana for inflicting casualties equal to or greater than 25% of the Hero's Leadership at once. +4 Mana when a stack dies. Additionally, +2 Mana for inflicting casualties equal to or greater than 25% of the Hero's Leadership at once. +6 Mana when a stack dies. Additionally, +3 Mana for inflicting casualties equal to or greater than 25% of the Hero's Leadership at once. Skill tree requirements: Warlock and Wight. I like how Transmute has been simplified tremendously. Overall it's weaker than it's been, too, which seems reasonable to me (Especially since the Vampire has other ways to generate ridiculous amounts of Mana), but I do like that in cases where you're, say, dealing with an oversized enemy army summoning massive stacks, those summons are worth full value. The secondary effect is notable for being subtly better in Daert's hands, since his lower Leadership means he finds it easier to trigger it. Even better? Transmute no longer cares about whether it was a Spell landing the hit or not! No longer is the blue class the one who most struggles to get use out of Transmute! On that note, though, it's worth pointing out that Transmute-derived Mana is added to your pool before Mana is drained to cover Spell costs. This makes it a bit less efficient/amazing than it could be, since eg having a Level 3 Geyser cast at max Mana that kills 8 units won't cause Level 3 Transmute to lead to a net gain of 8 Mana; you'll end up having spent 40 Mana with nothing gained out of Transmute. It's not usually a big deal, but it's worth keeping in mind when planning -occasionally you might find it worthwhile to handle your Spellslinging a little differently so you drain Mana before landing any kills, that kind of thing. As with Might and Spirit, now there's four Skills exclusive to the Vampire/Daert, all at the end of the tree. The Mage has always had the greatest clarity in their design all the way to the start of the series, but Dark Side still manages a pretty good job of making Daert his own thing, distinctive not only from his fellow class/characters but also from prior Mages, taking things in a bit of a different direction. 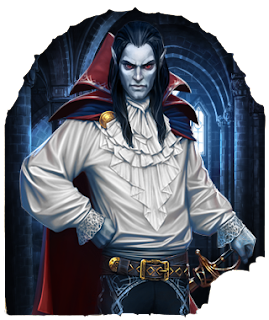 Somewhat surprisingly it has very little to do with his nature as a vampire, and it's a little bit strange of Dark Side to make 'is a vampire' correlate to the Mage class given vampires in prior entries have never been presented as particularly more magical than other beings in the games, but whatever. I'd rather have a strong gameplay concept that seems a bit off to its plot concept than have a weak gameplay concept that more strongly correlates to its plot concept. It would, for example, have arguably been more thematically appropriate for Puppeteer to be one of the Daert-exclusive Skills, but it would've been a poor fit to Maximum Magery. Surprisingly, in the long haul Daert is the class/character who tends to struggle most with the rising enemy quality. He tends to hit his overall high point in the mid-late game, and while you'll continue to gain Intellect until you've outright maxed every Magic Skill, the growth isn't explosive once you've gotten key Skills like Higher Magic maxed. Enemy army sizes continue to rise with alarming speed, meanwhile, eventually outstripping your ability to readily nuke them down. This makes Dark Side the only entry in the series where the Mage probably has the weakest endgame of the classes: Bagyr copes fine through Rage including powerful auto-scaling effects, and Neoline's army size copes surprisingly well with things, especially since she can still supplement with Rage and more supportive Spells. Daert's nuking capability falling behind doesn't have an equivalent ability to fall back on unit support or the like. It's an interesting scenario all-around. On a related note, this makes Dark Side the only entry where, if you don't think you can spare the time to do all the classes, the Mage is the one I would least recommend playing. Especially if you've been playing other entries in the series and so already have had your fair share of fun with Mages. +10% Magic resistance. Additionally, for every Magic tree Skill purchased (Starting from the tenth) you gain +1 Intellect, +1 Mana, and +1% overland Mana regeneration speed. Skill tree requirements: Everything Defiler, Warlock, and Wight. The Vampire's superskill, the one that scales with their entire tree and locks off access to all their other unique Skills. The Mana and Mana regen overland are both nice bonuses, but the big thing is that you don't actually care that Bibliophile got weakened because you're going to gain 34 Intellect if you purchase all the Magic Skills. All by itself Archmage makes Daert the Vampire the single most awesomely impressive Mage the series has ever seen. It's only because the other two have been pulled up even more that Daert isn't an obnoxious gamebreaker. Oh and I guess that 10% Magic resistance is nice. I suspect it's kind of meant as a shout-out to Archmages-the-unit providing 10% Magic resistance to adjacent allies. It's really not that important overall, though, especially as the main threatening Magic-damage enemies are largely past by the time you can get a hold of it. The Intellect boost is such a big deal it's often a good idea to prioritize Skills based on affordability more than their particular benefits within the Magic tree as Daert. Especially if you're near a multiple of 7 and so it'll have a particularly big impact. Winds of Magic is a really cool idea for a Skill, but is, oddly enough, merely a nice-to-have in actuality in Dark Side. Daert tends to have so much Mana to blow on individual battles that getting a portion of his spendings back is usually an ignorable benefit. So even though the third tier means Daert's Mana should go about 42% farther than the other class/characters' own Mana supplies... in actual practice it's primarily relevant for more Archmage-derived Intellect boosts. In fact, you should generally place it as one of the last Skills you bother to level as Daert, since it's fairly pricey. Generally it's better to try to spend those Might Runes into eg Anger if you can. It's too bad because seriously it's a pretty cool idea. Twice per battle, the Vampire may cast twice in a single turn, so long as the first Spell cast costs 10 Mana or less. Four times per battle, the Vampire may cast twice in a single turn, so long as the first Spell cast costs 15 Mana or less. Six times per battle, the Vampire may cast twice in a single turn, so long as the first Spell cast costs 20 Mana or less. Higher Magic remains awesome as always. All that's been re-tuned is its costs -which ties into the unfortunate trend of the Magic Skills being bizarrely Spirit and Might-intensive, making it harder for Daert to break into the other Skill trees properly. Higher Magic itself, though, has little to say I haven't said before. Spells permanently lower affected target's Magic resistance by 4, and additionally ignore 10% of the remaining positive resistance. Spells permanently lower affected target's Magic resistance by 8, and additionally ignore 20% of the remaining positive resistance. Spells permanently lower affected target's Magic resistance by 12, and additionally ignore 30% of the remaining positive resistance. And that's all the Skills and classes covered. Next time, I break from prior patterns to talk about Dark Side's plot a bit. See you then.